Classic Car Shipping: How to Ship Your Classic Car in the U.S.
Classic cars ready for shows, hot rods ready to race, and antique cars ready for restoration, deserve specialty enclosed carrier shipping when being shipped to another state. Cars old enough to be considered an antique, classic or vintage can’t survive with protection. Our enclosed carrier auto transport team transports show-worthy classic cars and hot rod dragsters to the 48 contiguous states. Have a race event in Los Angeles? We will ship your hot rod. Have a car show in New York? We’ll be ready to deliver your classic car for you. We can even move your car from Chicago, Illinois to Miami, Florida, with a pit stop in Dallas, Texas. What could more fun than traveling nationwide to visit car shows and hot-rod racing events? How Much Will It Cost to Ship My Classic Car to Another State? We have a free shipping quote online form to help you figure out about how much it will cost to ship your classic car to another state. The instant quotes are helpful if you’re thinking about buying a car online for a restoration project, but you’re not sure if it’s worth the transportation costs. If you’d like to join a car show or bring your hot rod to a NHRA event, but you know that your finished project car is feeling its age and can’t make the road trip, shipping your car in an enclosed carrier may be worth the memories. You can use the online form to see how much enclosed shipping for your car will cost. Weight, dates and timing will make a difference in the quotes you receive. The quotes for shipping your classic car to another state will fluctuate based on weight of the vehicle. You may be surprised that many of the larger 1960s vehicles weigh only a few pounds more than the more compact 21st century version. According to Autoweek, a 1967 Ford Fairlane weighs only around 20 pounds more than the compact 2017 Ford Focus. Similarly, a 1967 station wagon only weighs around 20 pounds more than a 2017 Dodge Challenger. A ’57 Chevy runs around 3,300 pounds, and so does a modern Chevy Malibu. If you restored a classic to original specs, don’t worry about the extra weight being any more than that of a modern car. However, if you’re showing off the big block engine in your Classic Chevy pickup, you’re adding some weight to the deal. Enclosed and open carriers in auto transport are subject to weight limitations. The weight of your classic vehicle will contribute to the legally allowed limit for the car carrier truck. Be sure to be realistic about the weight to prevent hassles and slowdowns at interstate weigh stations. Road trips can be expensive, especially when you’re hauling vehicles in a 10,000 pound truck. Distance will make a difference in price. If the price seems too steep for the full haul, perhaps you can make arrangements to pick it up at a closer city that you’ve been meaning to explore. These are only a few of the Southern routes our auto transport companies ship across, but we also ship on north-south routes across the United States. Be sure to fill out the quote form to see where our classic car shipping services are near you. If you’re going to ship your car in the summer or winter, pay attention to seasonal rates. Summer is the most popular time to move and a popular time for classic car shows, National Hot Rod Racing events (NHRA) and NASCAR events. This means that all reputable car carrier companies will be busy. Be sure to leave a window of time open in your schedule for pickup and delivery. The busy season also means prices will be a little higher. Winter is not a popular time for car shows or moving, but it is a classic time for Northerners to move South. If you need to ship your classic car in New York to your Florida home, trying arranging the move in the Fall instead of the Winter. You may get a cheaper price, and you won’t be competing for quality carrier service with other Snowbirds. Enclosed Carrier or Open Carrier for a Classic Car? Shipping a car in an enclosed carrier will cost more than shipping your car on an open car carrier. If you take into consideration the added protection given your car, the extra money you pay for shipping is worth the cost of repairing potential body damage from interstate traffic. (Do you really want to drive your classic car through an interstate construction zone? The dirt and rubble flying around won’t be considerate of the time you put into matching the original paint and masking your car.) On the other hand, if you need a car shipping quote because you’re buying an antique car or soon-to-be antique car and you just need an old car for parts or you know you’ll be replacing the body, an may be a more cost-effective option for you. However, you will need specialty service for a non-running car. We will help you connect to those services. Just be sure to select “non-running car” when you fill out our short and easy shipping quote form. We work with companies that offer special-handling for nationwide car transport. If care of your car is your primary concern, we will make sure your shipping services include expert handling and low-impact ramps. Will the Enclosed Carrier Shipping Company Drive My Classic Car? Only skilled drivers will load your classic car onto the enclosed carrier. Low grade ramps, interior and exterior protection, and soft tie-downs gives your showpiece the attention it deserves. Drivers at specialty enclosed carrier shipping companies have specific rules and regulations to follow for the loading and unloading of restored and unrestored classic and vintage cars. Drivers are not allowed to drive your classic car any more than necessary to for loading and delivery. You may, of course, give your drivers special instructions. In fact, if you have made any modifications to the car that the driver should be made aware of, it’s important that these are communicated before the scheduled shipping pickup time. Will My Classic Car Be Insured While Shipped to Another State? Our enclosed carrier services for classic cars are bonded and carry mandated insurance. Insurance is regulated by the Federal Motor Carrier Safety Administration, a division of the Department of Transportation. Insurance policies generally run between $750,000 and $5,000,000. Fill out the free quote form to see how much it will cost to ship your car to another state. Make sure the carrier company can ship your car to arrive on the date you need your car. 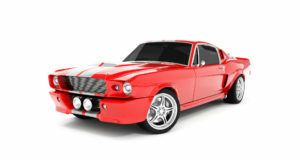 Ask the auto transport company how they will protect your classic car. View the classic car carrier’s certificate of insurance. Go to the website for the Federal Motor Carrier Safety Administration (FMCSA) and look up the company name. Make sure they are registered and insured. Discuss with the classic car auto transport company the exact dates for pickup and delivery, who will be meeting you, and where you will meet. Make the final agreement once you’re sure the details are correct. Protect your car by waxing it before shipping. Confirm condition in a written, signed statement by both parties. Take care of your travel arrangements while your car is being shipped. Inspect your car upon arrival and confirm condition. Go out for a classic Sunday drive! Shipping your car to another state is easy. A few minutes to fill out the online form, and you’ll be on the road to seeing your classic beauty delivered to another state. Our enclosed carrier transporters use the utmost care to respect the condition of your car, so it will be show-worthy when it arrives to your destination. When you’re ready to show your classic car, our carriers will be ready to deliver. Enjoy the show!